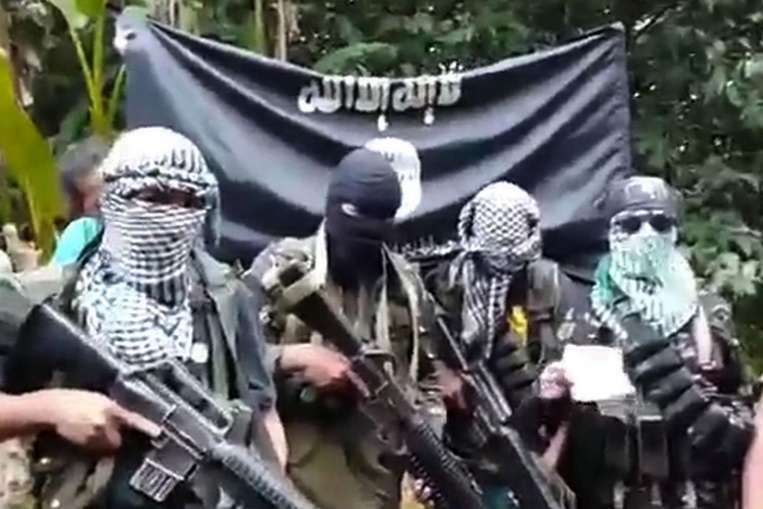 Members of the Islamic State affiliated Abu Sayyaf terror group. File photograph. Twelve Abu Sayyaf were killed and five soldiers wounded as government forces continue to battle the terror group on the island of Sulu. Colonel Gerry Besana, Western Mindanao Command information officer, said the first of four firefights broke out at about 10.30am yesterday (Thursday, April 11) near the town of Patikul. Col. Besana said the 45-minute battle erupted when troops from the Army’s 32nd Infantry Battalion encountered some 120 bandits led by Abu Sayyaf leader Radullan Sahiron and sub-leader Hatib Hajan Sawadjaan while on a combat operation. He said the second firefight broke out at about 3.45pm when troops belonging to the Army’s 1st Scout Ranger Battalion engaged some 80 terrorists who were followers of Sawadjaan and Almujer Yadah. He described how the militants “scampered toward different directions as the troops outmanoeuvred them”. The third firefight occurred at about 5.13pm and involved the Army’s 3rd Scout Ranger Battalion and some 10 terrorists. Col. Besana said the terrorists withdrew after two hours and 30 minutes, taking their casualties with them. The fourth engagement came as troops were on a pursuit operation against the fleeing terrorists. Since the encounters, troops gathered “reports from the ground” that 10 terrorists died while several others were wounded. As well as these 10, Col. Besana said troops retrieved two more dead bodies at the site of the first clash. He also said troops had recovered a pair of Night Vision Goggles, 40 makeshift tents, 50 water containers and five sacks of rice. The five wounded soldiers are now being treated at hospital. Brigadier General Divino Rey Pabayo, Joint Task Force Sulu commander, said the support and cooperation of the local community led to the successful conduct of operations and “that troops’ morale is also high due to the people’s continuous support”. Lieutenant General Arnel Dela Vega, Westmincom chief, said: “I commend the troops of the Joint Task Force Sulu for the recent accomplishments. Earlier this week, two other Abu Sayyaf militants were killed on Sulu, including one believed to have been involved in January’s deadly Jolo Cathedral bombing.